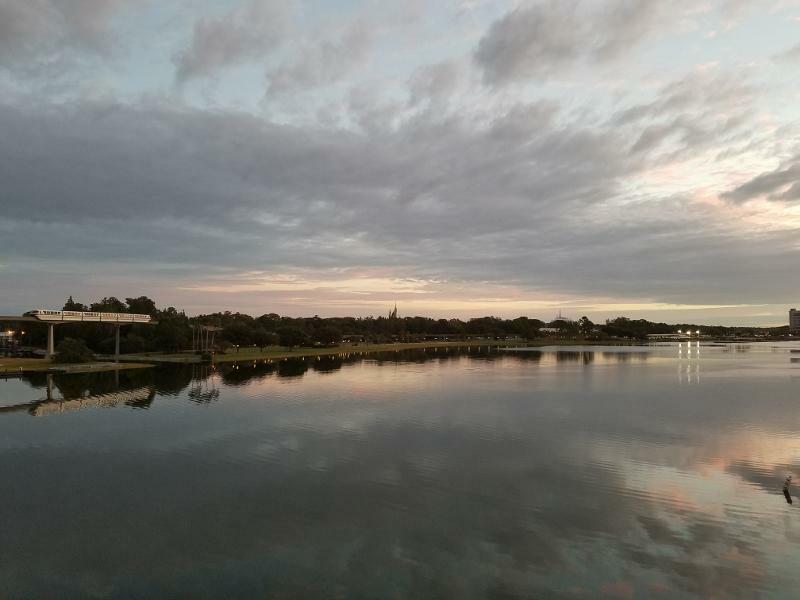 When the sun came up on Wednesday, November 9, I was standing on a balcony overlooking the western end of the Seven Seas Lagoon. I’d tried to sleep the night before but my husband wanted to watch the election returns. I stirred in the wee hours, heard the phrase, “his acceptance speech,” said to myself, “I reject this,” and rolled over to get more sleep. It didn’t work so well. My ten-year-old son woke first and he was crushed to learn that his candidate hadn’t won. He feared going back to school, partly because he’d been a vocal supporter of Hillary Clinton and partly because the new president-elect had mocked a disabled reporter and he thought his classmates would feel freer to mock his autism. My daughter woke early for her, all ready to celebrate with a day at Walt Disney World. She thought I was playing a poor practical joke. We had to turn on CBS This Morning; she wouldn’t believe it until Norah O’Donnell confirmed it for her. Days before, we’d decided that on one of the two days we’d be spending at Disney Studios (one of the four theme parks of the Walt Disney World Resort), we’d all wear our Star Wars gear. As we dressed, we decided it would be that day. My husband and I had matching T-shirts: Leia and Han silhouettes overlaid with “I love you” and “I know,” respectively. I did my hair in halfhearted Leia buns, did my daughter’s unruly hair in a three-looped Rey style (which became Leia buns by the end of the day). I saw Star Wars when I was 5, in the summer of 1977. I’d read the comic books and I had a handful of the toys already (Leia, Luke, Darth Vader, and Obi-Wan Kenobi) but I was still spellbound. I fell in love with Han Solo and decided I wanted to be Princess Leia. Last December, I took my kids to see The Force Awakens and watched my daughter be inspired by Rey in the same way. The first thing we encountered after orienting ourselves in the park was the hourly March of the First Order, where Captain Phasma marches her troops from the park entrance to a stage. Phasma demands allegiance from the gathered tourists—some of whom cheered and some of whom raised lightsabers in defiance—then marches back, all set to the foreboding Imperial March. Well, I said to myself, at least we got to see a woman in charge. After that, we decided to do a character meet-and-greet and get it out of the way before the park got too crowded. Choosing Dark Side before Light Side, we met Kylo Ren, an impressive character who used the movie character’s voice in a set of available phrases and interactions. But by that point, I was not feeling it when it came to Dark Side characters. The PhotoPass photographer snapped me digging in my heels, hands on hips, telling Ben Solo to call his mother (Leia) because she worries. It’s my new Twitter avatar. Our Light Side character was Chewbacca. I knew we’d be seeing him because we’d run into some friends in the Dark Side line who’d already visited the Light Side. My friend recommended a Wookiee hug—she was headed back for a second one—and I took her advice when we met Chewie. The last Star Wars themed thing we did at the parks that day was to ride Star Tours, a 3D, motion-simulated flight in a vehicle that creates realistic sensations of movement through space. It’s different set of destinations every time you ride it but the theme is the same: one of your fellow riders is a rebel spy (“I’m The Rebel Spy” T-shirts are in the gift shop) and Darth Vader is trying to use the Dark Side of The Force to capture and punish all riders on the shuttle. Of course, the Light Side prevails and you’re delivered safely to a rebellion or resistance destination. The moral of the story, as you often find in the Star Wars universe, is that the Light shines upon those who resist the Dark. I don’t know if my propensity toward rebellion came before or after the character of Princess Leia entered my life. I didn’t have much to rebel about before first grade except meatloaf (again) or wanting to pick my own clothes for school. My kids aren’t particularly rebellious, even though I encourage them to be. What they both do have is a quiet courage that gets them through everything from a normal school day to a week-long vacation full of overwhelming sights and smells that could trigger a meltdown at any moment. In the days following the election, inspired by our day at Disney Studios, I leaned heavily on my hero Leia both as inspiration for myself and for my kids. Leia never sat back and let things happen to her or around her unless there was no other option. Leia was always assessing her surroundings, noting whose talents could be utilized or what escape routes were available, creating plans with limited resources, and recruiting new rebels to her cause. Leia acted and had no time for words without action behind them. She’s a war-weary general now but she came into our consciousness as a clever politician. Pop culture doesn’t look kindly on female characters who are bold, take charge, and have little time for romance. Sure, there are occasional heroines we can look to as examples (see comic books and sci-fi especially) but very few female characters have these traits inherent to their character in and out of difficult situations and not just when it’s called for. Women in fiction often must “pay” for being outspoken or for making a difficult choice (even Leia, objectified after breaking Han out of the Carbonite). Unfortunately, this sentiment carries over into real life too. You might find an article praising an actress who juggles her career and family life but you’ll find many more articles questioning whether everyday women can “have it all” or asking who suffers when women balance work and family, professional and personal goals. Single women are shamed for being single. Single mothers are shamed for having children outside of marriage. Childfree women are shamed for not wanting or not being able to have children. Working mothers are shamed for working. Mothers who work full time caring for their families are shamed for not working outside the home. It seems America will be led by a man who said that working women getting pregnant is an “inconvenience” for business (part of his long history of objectification). He encourages people to hate and revels in his own hate. He demands allegiance and punishes those who don’t supplicate. He promises military might in exchange for diminished freedom. He plays upon fear to gain popularity. Forbes and Daily Kos compared him to a Sith Lord; the Forbes article appeared nearly a year before the election. My kids continued to ask why so many people—not a majority but more than expected—would vote for someone like the man he continues to portray himself to be. The best reply I could come up with is that fear affects choices, that if I had to guess, I’d say that some people voted out of fear whether they recognized it as fear or not. As we know, fear leads to anger. Anger leads to hate. Hate leads to suffering. Fear is the path to the Dark Side. For as much darkness as there can be—either for one person, a nation, a planet, or a galaxy—there will be light. It’s tempting to stay in darkness or to let fear control or suppress action. But what would Princess Leia do? Act. Rebel. Lead. Speak truth to power. Retain compassion. Be resolute. Control what you can, even in the face of fear. Strive toward the Light. Editor’s Note: This essay was composed before the passing of writer and actor Carrie Fisher and is dedicated to her memory. This entry was posted in Issue 16:4 and tagged Baker, Snark Zone, Stephanie Lenz by TC Editors. Bookmark the permalink.